Hello there, hacker! My name is Pia Carrot, although I prefer to go by Aizawa these days. Today I would like to introduce to you the Pokemon Crystal disassembly and the potential it has for ROM hackers. You may remember me from my older tutorial, Pokéred for Dummies, which was not complete. I aim to release a complete guide this time, and I am rather confident I can complete this one. I would like to thank Rangi, Mateo, comet, Mmmmm, and so many more for help and information on how many things in the disassembly work, so a big shoutout to them for making this guide possible. Please keep in mind all my guides are for Windows, I can not help with issues relating to Linux and Mac. Without further ado, let's begin! On top of this I recommend you use a program like Notepad++ to edit files. It's much more useful than standard Notepad and has very useful functions like find + replace all. Once you have the disassembly installed, you will need to install Crowdmap, by Yenatch. You could also edit maps in hex but I do not recommend this. the following is transcribed from http://creativiii.com/guide-pokecrystal-disassembly/ All credit to Leonardo Petrucci. Editing and adding maps is thankfully one of the easiest jobs to do thanks to tools developed by the community, however it might still be kind of tricky, so I’m going to try to explain everything. Assuming that you already have your Cygwin set up and the disassembly downloaded, adding maps should be fairly easy. In this we will be adding a new area connected to New Bark Town, so that it will be easier for you to test out. Let’s start it off simple enough by setting up Crowdmap, this neat little program will give you a visual of your maps without having to build the game every time, it will also help you add new maps and edit them. You can find the download here, drop the crowdmap folder into your pokecrystal directory, it should look something like this pokecrystal/crowdmap/. The instructions to start Crowdmap are fairly simple and are explained dirctly in the github page. Once set up, you should be able the fairly simple to use interface. Let’s click on + New Map to add a new map. I’m going to set the name to Route101, you can use whatever you want. The map group is going to define how your map is ordered with the others, I set Mapgroup24, since it’s the one where New Bark Town already is. This will automatically add the lines I explain how to add next, so when following those steps, make sure not to add any additional lines, but edit the already existing one instead. CTRL+F should find your newly added map fairly easily. 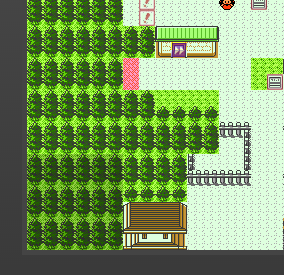 This not only sets the name for the map, but also the tileset it’s using (TILESET_JOHTO_1), the name your map is going to be referred to in the code (ROUTE_101), the music (MUSIC_ROUTE_29). The other entries can be looked over, these are the most important. This is going to be used to define the size of your map, 10 and 10 being my X and Y. Once that is done move over to maps/second_map_headers.asm, as we already did before, let’s copy the already existing Route 29 entry and trim it down a little bit, since we won’t need all the entries it has. Our route only has one entry point, from the south of New Bark Town, which means that New Bark Town will need a connection to the south, and our map will need one to the north. Your area entry should look something like this. Of course here you have the name of your route, the name of your file, what defines what fills the sides of your map ($5), and where the connection is going to be (NORTH). On the next line you will define the connection to the north. NEW_BARK_TOWN, of course, is the name of the file you want to connect to, NewBarkTown is the name of the map. 0/0/10 are what defines where your connection starts, let’s call them X, Y and Z. X will move where the connection to the map starts, 0 will be perfect center, 1 will move it to the right, and -1 moves it to the left. Y does the exact thing as X, just on another axis, 1 will move it up, -1 will move it down and 0 will be exactly at the center. Z is probably the most important, it’s what defines the size of the connection. This might require you some fiddling, but you should be able to figure it out fairly easily trough trial and error. Let’s add a connection to the south by adding | south. Should be the same as the first one you added for your area, just with the names inverted. I’m going to make it perfectly clear that despite Crowdmap being listed as an option, it is an extremely powerful tool that YOU SHOULD USE. Download it and set it up, it will help you a lot. In order to edit maps in Crowdmap, simply follow the instructions from the readme. From there, you can edit the maps as you would any other map editor! It's still missing a lot of features, such as a block editor, but it does what it needs to do! If you are having issues getting it to save, spam click save and tell the notifications to stop, and if you are getting off graphical errors on your maps, clear your cache. The only downside to browser map editing. Warps are probably the most simple thing to add into a map. 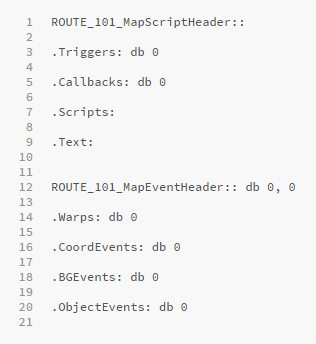 All the warps are contained directly into the ASM for the map you’re currently editing, in our case, Route101.asm. Let’s add a warp between New Bark Town and the new map. First off, let’s add a way to visually tell the player that there is a warp in New Bark, this can be done by many means, I decided to go for the pink patterns. Did you notice that I also changed db 4 to db 6? The number after db should always be the same number as the number of events listed after it. Now you have two options: Either manually change the X and Y values of your warps to bring them to where you want them OR go into crowdmap and drag them where you need them. As you can see, right now, the warps are positioned at X1 and Y1. Just move them where you want them in crowdmap. Now let’s move on to our new map and do what we just did for New Bark here. This is pretty straight forward, the editing is pretty much the same, but in a different file. The only thing you should look out for is the third number used after the X and Y positions that we will call Z. Z is there to tell the game on which warp the player should come out once they walk into one. If Z is 1, once the player enters in the warp in ROUTE_101, he will end up coming out of Elm’s Lab. In this case you either want to set Z as 5 or 6, so that the player will come out of the same warp they came in. As discussed with warps, the two numbers after signpost are the X and Y coordinates of the event. You can either edit them from the code, or move them around in crowdmap. Text is the start of the text, it should always be what starts your text. Para will start a new paragraph, while Line will continue writing automatically under para without input. Cont will instead only appear if input is received. Done is of course what ends the text, it should always be at the end. I first encountered this right after adding my first map. This is caused by problems with the compression script that handles some of the tilesets, and unfortunately there isn’t an easy fix. What you can do is open up all your Data_*.asm files and move things between them until the error isn’t there anymore. This might take a while, but it’s unlikely you will experience it again once fixed. It’s mostly done trough trial and error, so I can’t help you much on that front. This is a similar problem to the one described before. As far as I’ve noticed, it’s caused because too much data is being uploaded to a single Bank. The fix for this is the same for the one before, but unlike with the previously described error, the terminal will not tell you which file is too big, and it will be up to you to figure out. In your Cygwin terminal, and then run “make” again. Okay, so you've made a few maps, moved some events around, and you're ready to make your rival battle or change that Rattata into a Bidoof. Maybe you want to add that swanky new tree tile, or change your player's appearance? Well, here is how you can do it. Any and all graphical assets are going to be found in the gfx folder, obviously. I'll leave it up to you to find what you need, since most of it is obvious, but if you cant find that weird interface graphic or that player backsprite, it's probably in misc. Once you decompress your image, you can edit it, although if it compiles and your new sprite palette does not change, you'll have to edit the sprites .pal file, which can also be found in gfx. You can do this in Notepad ++. To find the RGB values you need, simply divide the corresponding RGB values in Paint by 8. Also, if you want to disable sprite animations for a Pokemon sprite you've changed, because the animation no longer looks right, for obvious reasons, you simply edit the files gfx/pics/anims.asm and gfx/pics/extras.asm. Replace each Pokémon's "INCLUDE" line with just "endanim". You can also edit bitmasks.asm, kanto_frames.asm, and johto_frames.asm, removing the "INCLUDE"s entirely, since they're no longer needed. Credit to Rangi for this method. So I'm not actually going to get too in depth about adding new Pokemon, since it isn't really something I've looked into, due to restrictions the engine has placed on itself, however, hopefully this will soon be remedied. However, as for replacing existing Pokémon, I can help you there. So assuming you now know how to change a Pokémon's sprite from the last section, I'll be getting into how to change the name, base stats, etc. Please note I'm not sure how cries work at this time so I can't help you there. Most of the Pokémon's info can be found in the data folder, under base_stats, pokedex/entries, pokemon_names.asm, and so on. Not much else to say about this, it's very easy to do. Scripting might take a bit to learn, I still haven't mastered it but you if open up any maps .asm file in the maps folder, you can see each one has a set of scripts. If you've ever used PKSV or XSE it should come pretty easily to you. Battle might require a bit more effort to set up but not impossible at all. Just reference some battle code on Route 30, or your rival in Cherrygrove City for some ideas. If you refer to the mapping section Leonardo goes over adding signs, this is a very easy way to get started with scripting. This section will eventually be redone once I have an in depth scripting guide prepared for it. Wild Pokemon data can be edited in data/wild. As far as I know there is no way to make different water encounters for every route, but if someone decides to create a way and decides to share it, let me know so I can include it here. As for legendary battles like Lugia, Ho-oh, etc, reference their code from Tin Tower and Whirl Islands. Creating your own is very simple! It's recommended you set up a fork on github, I personally do not do this. A lot of code is pretty spaghetti, so don't get too upset if something is frustrating to work with. I hope this guide has helped you with your interest in Gen II hacking and if you did be sure to leave a thanks and spread the word. I had a lot of fun writing it, and I can only hope it will help others get started with the disassembly. Thanks for looking!